Jerry Garcia achieved monumental accomplishments over a prolific career, yet the guitarist never sounded better than on his first official collaboration with longtime friend and fellow instrumental maestro David Grisman. Indeed, contemporary interest in roots music can be directly traced to this stellar Grammy-nominated 1991 collaboration. Putting distinctive rustic spins on pop standards, blues classics, and folk staples, the kindred musical spirits’ earnest authenticity and relaxed intimacy are matched only by virtuosic playing and superb production. As realistic, warm, close-up, and immersive as any acoustic album, Mobile Fidelity’s reissue raises the bar on the meaning of reference-standard. Mastered from the original master tapes, Mobile Fidelity’s hybrid SACD of Garcia/Grisman takes a record forever renowned for breathtaking sonics to another level. Originally released on Grisman’s fabled Acoustic Disc label and recorded at his plush studios, the album now sounds even more realistic—with distinctive tones, palpable air, smooth vocals, three-dimensional soundstaging, balanced imaging, and timbral extension that mirror the feeling and experience of hearing live music in a small space. 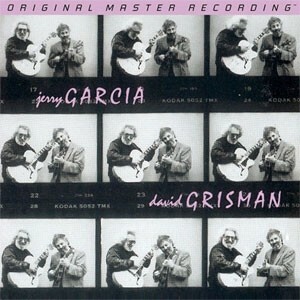 Unadorned with any post-production tricks or overdubs, Garcia/Grisman breathes with naturalism and presence. You will effortlessly detect the full body of the instruments, witness the woody grain textures, and get lost in the surprisingly velvety qualities of Garcia’s lullaby-like singing. Mobile Fidelity’s meticulous pressing also marks the first time this delightfully joyous affair has been issued on hybrid SACD. You will never hear a better-sounding Americana-styled recording. Pals since the mid-1960s, Garcia and Grisman bonded over their love for traditional folk and bluegrass. The two teamed up amidst what became a gold rush of top-notch productivity and creativity for Garcia. Partnering with bassist Jim Kerwin and percussionist/fiddler Joe Craven, the pair approaches every passage with innate ease, as if either musician could finish the others sentence. The affable chemistry and soothing interplay wash over a selection of songs as notable for their diversity as the way Garcia and “Dawg” turn them into the equivalent of old friends you haven’t seen in years. Exquisite melodies and jewel-shaped notes decorate the simple, convivial structures of tunes that hop, jump, skip, skitter, and bop. The atmosphere is reminiscent of the legendary gypsy-jazz exchanges between Django Reinhardt and Stephane Grappelli, and equally sharp. Swirling with Middle Eastern modality, the closing 16-minute-plus rendition of Grisman’s rippling “Arabia”—complete with a section based on a Cuban fold theme—is alone enough worth the price of admission to this sensational session. But there’s so much more. The quartet delves into Celtic themes (“Two Soldiers”), jazz-grass (“Grateful Dawg”), old-world ballads (“Russian Lullaby”), and Appalachian flavors (“Walkin’ Boss”) with nonpareil skill and soulfulness. Garcia and Grisman’s tandem picking throughout epitomize sublime. And for many listeners, the duo’s revised version of the Grateful Dead staple “Friend of the Devil” ranks as the finest-ever recorded, the pace patient, the narrative vocals heartfelt, and the synchronous solos tailor-made for the enveloping progression. Better yet, it’s all captured in astonishing fidelity.